I love to make the time for meditation. It makes my whole life go smoother, and I am more relaxed yet focused on the important things in my life. The little things in life don’t stress me out nearly as much when I’m regularly meditating. There are many very good reasons to meditate. I have a short list here. 1. There are definitely health benefits from meditating. 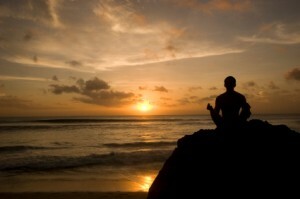 The overall health benefits from meditating are largely due to the stress reduction it gives. Neuro-scientists have found that brain activity shifts from the stressed-out right frontal cortex area to the mellower left frontal area. 2. You will have improved concentration, alertness and a clearer mind. 3. You will have less irritability and better emotional control. 4. Your self-awareness and understanding of your deepest self and life’s purpose will be enhanced. You just need to SLOW down and listen! Here’s a great video of my favorite ways to meditate. You can order my favorite meditation music CD – Deuter East of the Full Moon! This entry was posted on Tuesday, April 12th, 2011 at 8:30 pm	and is filed under Stress Management. You can follow any responses to this entry through the RSS 2.0 feed. Both comments and pings are currently closed. Hola! I’ve been following your website for a while now and finally got the bravery to go ahead and give you a shout out from Austin Texas! Just wanted to tell you keep up the good job! Congratulations on possessing definitely one of probably the most subtle blogs Ive arrive throughout in some time! Its just amazing how a lot you’ll be capable to think about away from a factor basically merely due to how visually stunning it is. Youve place collectively an incredible blog web site space –nice graphics, motion pictures, layout. This is definitely a should-see website! Thanks for your comment. Meditation sure helps keep me sane! Don’t forget to sign up for the free energy healing video to reduce stress. It has some great info as well. Thank you greatly for revealing plenty of this great material! Longing for looking at more discussions!